I just wanted to share with you one of my weekend finds. I was in a little gift shop in Marlborough High Street when I came across some of Sophie Allport's designs. I made a note of the name and looked her up on the web when I got home. 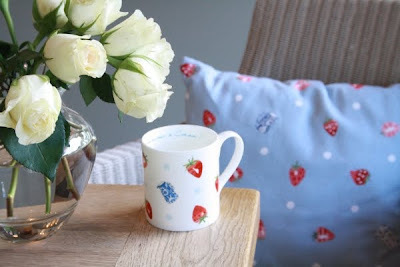 Her website is bursting with gorgeous patterns, one of my favourites being the 'strawberries and cream' range which this mug belongs to. You can also buy the patterns as fabric (by the metre) or as greetings cards.